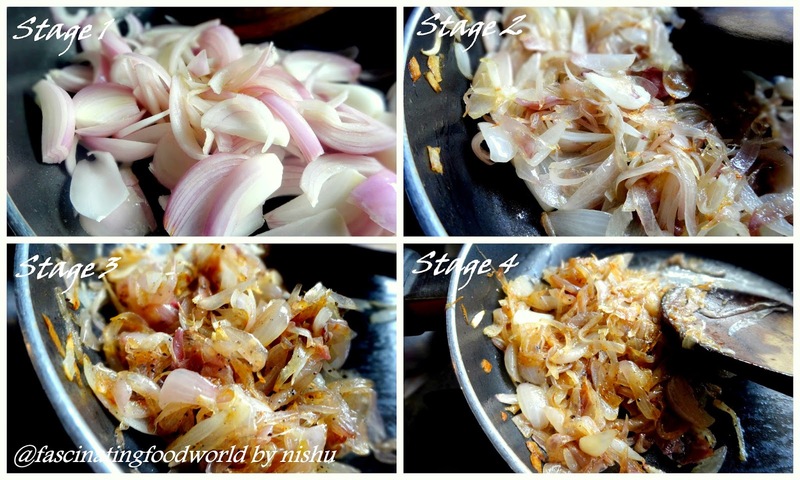 Caramelization of onion is a process which involves slow cooking of onions for 35-40 minutes over low heat. When you cook them slowly, natural sugar of onions caramelize making them intensely sweet and full of flavour. Caramelized onions are mostly used in French Onion Soup but they are beautiful in salad, crostini, tart and pizza too. Another name of caramelized name is onion jam which can be stored for about a week in refrigerator. Heat oil in a non-stick deep pan and add onions once the oil is hot. Sprinkle salt and sugar over onions, stir properly and finally spread onions evenly over the pan to cook. Keep stirring every 5 minutes. After 30 minutes, add black pepper and balsamic vinegar to deglaze the pan which will add extra flavour in the onions. Cook for another 10 minutes and take off the heat. Once onions cool down, store them in an air-tight container and refrigerate to use for about a week. 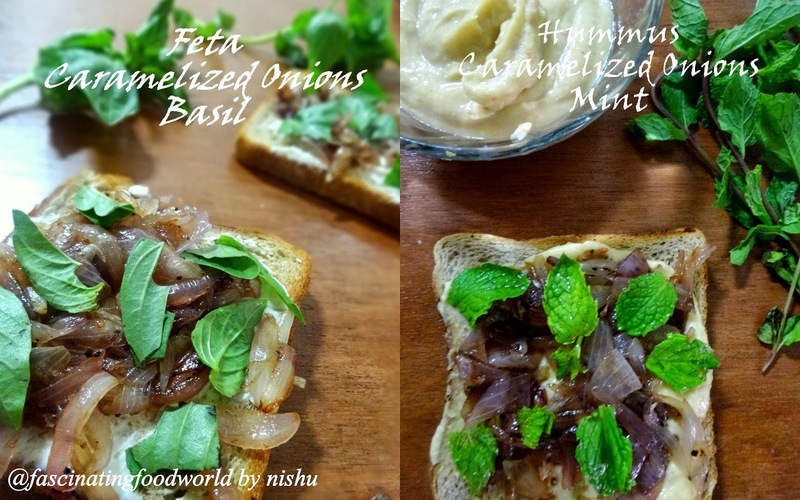 Today I am going to share recipe of two crostini/ bruschetta using caramelized onions which will make you believe that simple food tastes the best. These two crostini might look same but flavours are very different. You all are very well aware with my love for feta. It's just an amazing cheese. I discovered Feta 3 years back when my brother got it from Middle east. As excited as I was about tasting it, I fell in love with it's flavour at that very moment. Throw it in salads, use in sandwiches, slather it on a hummus pizza, relish with fruits like figs, guava , pack it up in quesadillas, falafel. You can create magic using feta. Spread feta cheese (as much as you like!) on a bread followed by caramelized onions. Bake in oven at 200 degrees for about 10 minutes or untill crisp. While holidaying in New Zealand, I had the most amazing pizza which I will never be able to forget. Hummus pizza! Toppings being caramelized onions, kalamata olives, feta, sweet peppers, that stunning pizza tantalized my taste buds. Find my recipe of hummus here. Spread hummus on a slice of bread followed by caramelized onions. Bake in oven at 200 degree Celsius for 10 minutes. 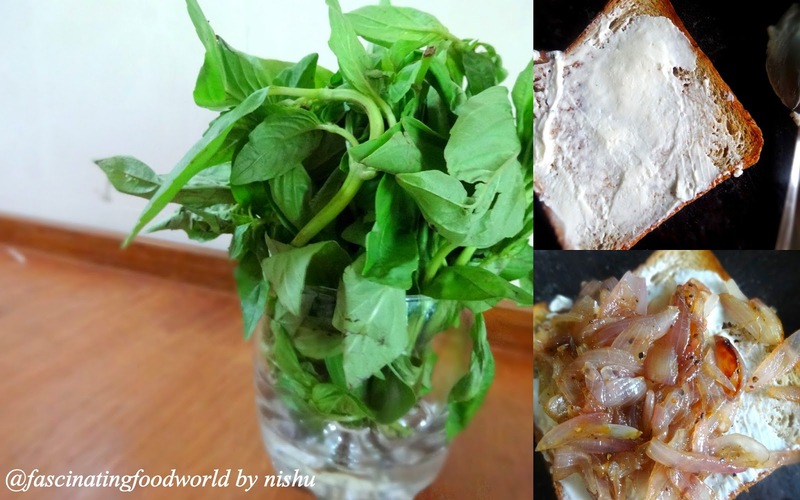 Crostini is ideally made with Italian breads but it's really fine to use basic bread too. These two crostinis can be a great starter to welcome your guests. Always, always remember to preheat oven. During caramelizing onions, add little water if onions start burning.